The Boji Marine / RV Filter / Softener is constructed of the finest thermoplastic materials and should provide a lifetime of trouble free use. There are no moving parts to wear out and the softener is resistant to all corrosive environments encountered in boating. The unit is designed to soften your dockside water supply, providing you with generous amounts of soft water for drinking, bathing and washing your boat. The Marine Filter/Softener works the same as a conventional water softener. However, there are no time clocks, solenoids or directional valves to malfunction. No external power source is required. The unit is simply installed between the water supply source and the vessel's or RV's water supply hose. When the water is turned on, water flows through the Boji, filtering and softening as it goes. That's all there is to it! 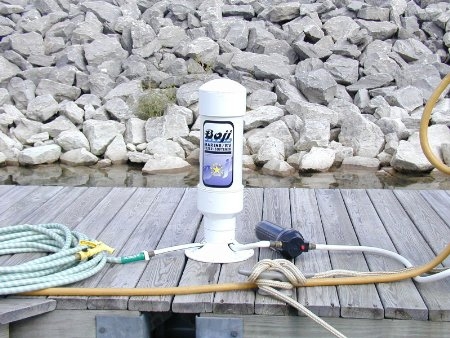 Setting Up & Using Your Boji Water Filter / Softener: If your unit is to be used in a marine application, it is a good idea to rig your softener with a simple safety lanyard so that it can be tied to a mooring cleat or some other stationary object on the dock to prevent its loss overboard. The lanyard can be fashioned from light rope and will also aid in handling the unit from dock to on board storage. The Genova Boji Marine / RV Water Softener works in the same manner as a commercial manually operated water conditioner. There are no time clocks, solenoids or directional valves to malfunction. No external power source is required. The unit is simply installed between the water supply source and the vessel's or RV's water supply hose. A standard canister water filter, utilizing standard 3/4" M.I.P. (male iron pipe) x male and female brass hose fittings can be screwed directly into the inlet of the marine softener. When the water is turned on, water flows through the filter and then is allowed to flow through the softener, softening as it goes. That's all there is to it! Depending on the hardness of the water supply source, your Marine / RV Water Softener will require periodic "regeneration" to maintain its water softening capabilities. The canister type water filter unit previously mentioned easily facilitates this regeneration process. Regeneration is easily done utilizing pure pelletized water softener salt cubes, available from a variety of local sources. You can determine if your softener needs regeneration from the following signs: the water "feels" hard -- a definite increase in "water spotting" is noticed on sprayed surfaces left to dry -- it becomes difficult to maintain suds while washing. How The Boji Works: As the hard water passes through the Ion Exchange resin, an exchange of ions takes place. The hardness ions which have attracted themselves to the hard water molecules are attached to the Ion Exchange beads. As they release from the water molecules and reattach themselves to the resin beads, those beads are caused to release an equal volume of sodium ions. Once released, these sodium ions are attracted to the water molecules and attach themselves in place of the hardness ions previously released. In actuality, this is an instantaneous process and continues until all of the sodium ions attached to the Ion Exchange resin beads have been exchanged. Once the sodium ions contained on the Ion Exchange resin beads have been exhausted, the water softening process ceases. Hard water entering the water softener passes through the resin bed and exits unchanged. To reactivate the water softener, the beads contained in the Ion Exchange resin bed must be "Regenerated." This is accomplished by washing the Ion Exchange resin bed with a salt water solution. Regenerating The Boji Using Genova's Water Meter Valve: You will quickly learn the cycle of regeration requirements based on your particular water usage and it will become easy to anticipate when the time for regeneration is approaching. It is always best to regenerate your unit before its softening powers are completely depleted. Using Genova's Water Meter Valve (Part #WT101) enables the user to determine when the Boji requires regeneration. The valve has a female hose threaded inlet and a male hose threaded outlet, enabling it to be connected directly to either the water prefilter or Boji. Do I have hard water? : A simple test will tell you if you have "hard" water. Fill a small capped bottle 1/3 full with the water to be tested. Add one small drop of dish or similar liquid soap. Vigorously shake the capped bottle until you see a layer of suds. If the suds quickly collapse and disappear, the water is hard. If the suds layer remains and breaks down very slowly, the water is soft. Didmeninė prekyba aukšto sėgio vamzdžiais, grindimis ir tvoromis.